For optimum durability, reliability and value, the Combi 2-EZ® case erector is your clear choice for case erecting and bottom sealing. 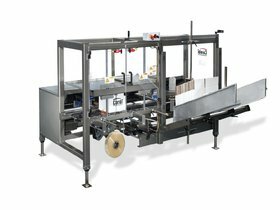 This proven bottom sealing machine is built with the industry's strongest frame (lifetime warranty) for the most demanding 3 shift environments. The versatile Combi 2-EZ® case erector can form and seal the widest variety of cases, from single wall to triple wall corrugated. Add the Combi 2-EZ® case former to your line for instant productivity. INTELLIGENT and SAFE design utilizes solid state sensors and photoeyes for dependable operation throughout the erecting process.